Modernism and the making of the Soviet New Man is an essay on enthusiasm. Carlo Ginzburg’s The Cheese and the Worms: The Cosmos of a Sixteenth-century Miller. It taught me that meticulously researched scholarship can also be fun and shed valuable light on human folly. Most of my research was done in Russian literary, cinematic, and government archives. The chapter on the Russian baths (“banyas”), however, involved me visiting in person the modernist banyas in Moscow and St Petersburg. It was a novel architectural but also personal experience as I had to adapt to the culture of spending time with fellow bathers stark naked. A specific technique I use when I get “stuck” in my writing is to start writing in another language. Some passages in my book were initially written in Serbian or Russian. Writing in a different “voice” enriches my writing in English and frees me up. It also however, points to the weak parts, because they sound terrible in a foreign language. MUP is one of the most distinguished publishers in the field of cultural history, open to exploring new avenues and approaches. The support I had for my work from MUP, from the initial proposal and peer review stages to promoting the final product was amazing. I have had the privilege to collaborate with some truly exceptional people. I am still working on Second World architecture and material culture, but I have moved on from the 1920s and the 1930s to the era of the Cold War. I have been selected as a 2018 Fellow of the Institute of Advanced Studies at the University of Strasbourg where I am working on a project titled “Communism, Internationalism, Nature: A Cold War History of Environmental Representation”. It looks at the convergence of Communist internationalism, Cold War geopolitics and environmental imagination in Second World projects to create a new world system in the 1960s and the 1970s. I rewrote the text half a dozen times. It helped me think through the text but there were maybe some more efficient ways to do that. Will minimise the number of rewrites next time. Among scholarly books, it is Vladimir Paperny’s Architecture in the Age of Stalin. It was inspiration and a model for this book. In the world of fiction, it is Ilya Ilf and Evgeny Petrof’s Golden Calf. It is by far the funniest and most insightful book I have ever read, a masterpiece on the chaos of Russia during the 1920s. The Golden Calf is a work of Soviet satirical fiction. This is perhaps my most favourite genre. I am not only fascinated by Soviet architecture but also by amazing Soviet humour, from Harms’s and Vvedensky’s absurdism to Venedikt Yerofeev’s “Moscow Petushki” and contemporary prose of Viktor Pelevin. I think I have already had the best academic dinner party with Michael Osman, Zeynep Celik, Lucia Alais, Olga Touloumi and MUP’s own Mechtild Widrich – when we were all working on our first books! 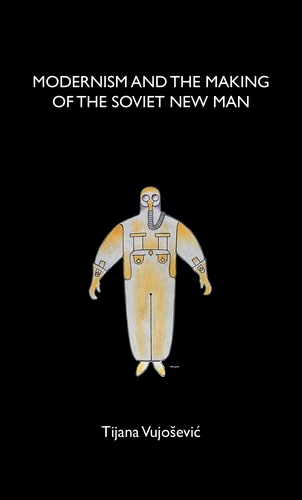 Modernism and the making of the Soviet New Man is available to buy in paperback now. Category: Art History, Author Q&A, Blog, History, Social History, Sociology	0 Comments.